We’ve all heard about the importance of healthy eating and living for longevity, but how influential is it for cancer, specifically? Are diet and lifestyle influential enough to significantly reduce cancer formation and progression? Approximately 30-40% of cancer diagnoses could be prevented by modest diet and lifestyle changes. This number increases to 90% for certain cancers, like stomach cancer. In 2017 alone, 675,512 cancer diagnoses could have been avoided! Healthy eating is important, especially as it related to cancer. 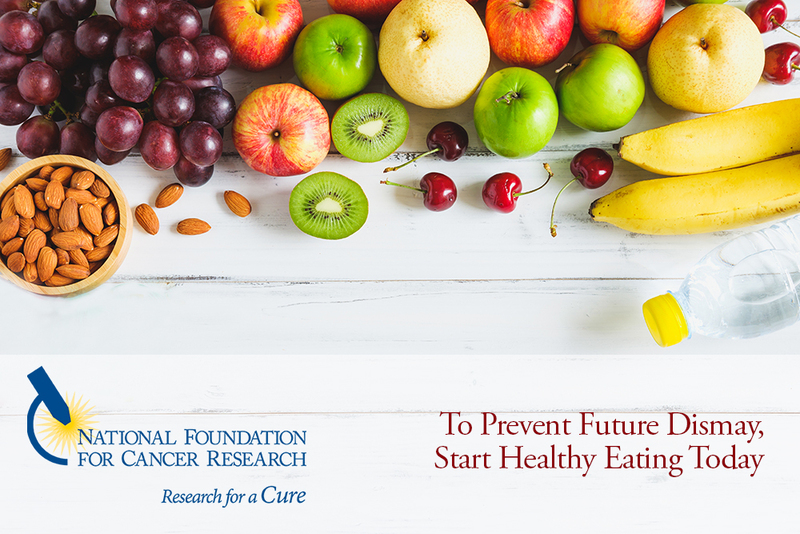 And in recognition of National Nutrition Month, this National Foundation for Cancer Research blog post will offer a deeper look into the science of this important correlation. Nutrition interacts with cancer development in many important ways. The first is through the potential introduction of carcinogenic (cancer causing) materials into the body. If carcinogenic materials are introduced into the body, these will by definition increase cancer risk. These chemicals can be thought of as toxic; their very presence is inherently contradictory to health. But there are still multiple possibly carcinogenic materials which are not yet banned by the U.S. Food and Drug Administration. Many of these are added chemicals or “additives” that are used to preserve food, alter the foods texture, or change the foods appearance. A simple way to avoid these chemicals (without carrying around a big list) is to refrain from, or minimize, eating processed foods with ingredients that you don’t recognize or that you know aren’t whole-food based. Many times foods such as these are of low quality. They are generally low in healthy micronutrients and more refined, so the nutrients they do have are less bioavailable (nutrients aren’t able to be integrated into the body). They are also hyper-palatable so that the reward centers in the brain are extremely active during consumption, which leads to overindulgence. Perhaps most importantly, these foods can be embedded with potentially toxic materials. Specific compounds to steer clear from are nitrates/nitrites, carrageenan, and BHA/BHT (butylated hydroxyanisole / butylated hydroxytoluene). These have all been shown to have carcinogenic properties. Some foods and drinks have materials in them that aren’t carcinogenic themselves but can produce carcinogenic materials during their cooking process, breakdown or detoxification. In other words, as the body processes these materials or as they’re prepared, intermediate materials are produced which are carcinogenic. Alcohol is one such substance that can have a carcinogenic effect on the body. Alcohol is broken down in the liver to produce a metabolite called acetaldehyde, which is considered a definite carcinogen. Acetaldehyde is genotoxic, which means that it damages the genetic material of the cell, increasing the likelihood of mutations. The second common potentially carcinogenic food is red meat. While there is interest in looking at the inherent carcinogenic qualities of red meat, research is not yet conclusive on this matter. For this reason, red meat is currently classified as a probable carcinogen. However, when meat is cooked at high temperatures, many known carcinogens are produced. These include heterocyclic amines, polycyclic aromatic hydrocarbons and acrylamide. These products help create some of the aroma and browning associated with cooked meat. Although tasty, these certainly do contribute to cancer; especially colorectal cancer. It is therefore much better to consume a reduced amount of red meat and cook red meat that is consumed at lower temperatures. Luckily, eating healthy isn’t all about avoiding foods! It’s also important to include nourishing foods with anti-cancer properties. Some of these properties include antioxidant status and micronutrient density. Antioxidants are chemicals which oppose free radicals (compounds which react uncontrollably with oxygen) by stabilizing the cell. Micronutrient density has to do with the amount of vitamins and minerals within foods. Each vitamin and mineral plays an integral role in the healthy functioning of various body tissues. Important anti-cancer micro nutrients include calcium, zinc, vitamin A, vitamin K2, vitamin D, vitamin C and the B vitamins—with are loaded with folates. Fruits and vegetables are both incredibly important to ensure that antioxidant and micronutrient status are good. Fruits and vegetables are also important for their inherent fiber which has been proven to help reduce certain cancers. Another important consideration in eating for cancer prevention is energy balance. The best condition for our physical health is one where we are only consuming the calories that we need to function well. This is helpful because it can reduce the burden of digestion, detoxification and unnecessary hormonal influence. If we don’t need the energy, why stress our bodies out more by consuming it? Such just forces our bodies to have to adjust functioning and find a place to store the excess? In addition, the added hormonal, structural, and metabolic stress of carrying extra weight can significantly influence our overall health. Obesity is a major risk factor for cancer. In fact, 20% of cancers could be avoided by reducing obesity. Eating based on our needs can help us reduce waste, externally and internally. It fosters a healthy connection of our minds to our health needs and allows us to build mindfulness into our daily lives. There are many different components of eating for cancer prevention. Not only is it beneficial to minimizing outright carcinogen ingestion, but we also want to be aware of carcinogens which emerge as a result of cooking or detoxification. Once we reduce the intake of these foods, we then want to increase fruits and vegetables due to their antioxidant qualities, micronutrient density and intrinsic fiber. Finally, it’s important to be aware of balancing energy demand with energy consumption. The overall goal is to eat food which can support our bodies healthy functioning and reduce our overall stress. Can you site your references for carrageenan as being a carcinogenic food ingredient to be avoided?